Football season is upon us! One of my favorite times of the year. One food that I always think of when I'm watching football is chili. I have taken this family favorite & made it healthier with lean ground turkey & loading it up with tons of veggie goodness. 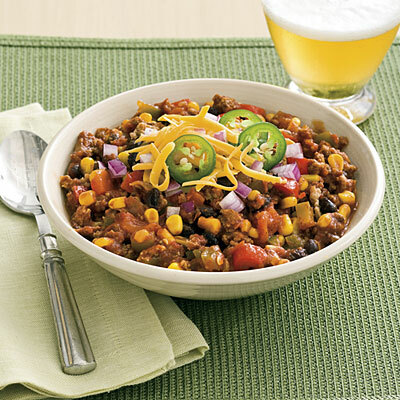 It is full of flavor & aims to please all the hungry football fans in your house! 1. Brown 1 lb. extra lean ground turkey seasoned with 1 tsp. sea salt, 1 Tbls. garlic powder OR 1 crushed clove of fresh garlic, & fresh ground black pepper to taste. 2. Add 1 chopped bell pepper (any color you like) & 1 diced onion. Allow to soften slightly. 3. Add one can diced tomatoes (no salt added) & one can tomato sauce (no salt added). Stir in 1 cup frozen (or fresh if in season) corn kernels, 1 can black beans (drained & rinsed). If you want to amp up the spice, add a diced banana or jalepeno pepper. 4. Add 2 Tbls. no salt added chili powder, 1 Tbls. cumin, black pepper to taste, 2 tsp. garlic powder, 1 tsp. sea salt. If you want some more spice add some red pepper flakes & / or some paprika. 5. Simmer on low heat for at least 1 hour to let the flavors develop. Top with a spoonful of plain Greek yogurt in place of the traditional sour cream & a sprinkle of freshly grated sharp cheddar cheese.